July 5, 2014 – Savvycom is delighted to have been listed in SourcingLine’s Leaders Matrix as a top Ruby on Rails development company. The research carried out by SourcingLine identifies leading web development companies that focus on Ruby programming language. Analysts reached out to firms with a demonstrated history of successful projects for both domestic and international clients. Official findings are based on a firm’s proven experience, positive client reviews, and market presence. Companion directories were also published, which allow buyers to search for vendors that best fit their project needs and requirements. At Savvycom, we are proud of a dozen-member-team of Ruby on Rails, who is master in this programming language. Our Ruby on Rails developer team can easily solve many complex web problems utilizing this excellent framework. We are committed to provide entrepreneurs sustainable solutions, quality services and superior support for this latest and well-known open source technology. For startups, our expert RoR programmers can develop systems tailored to meet your business needs. 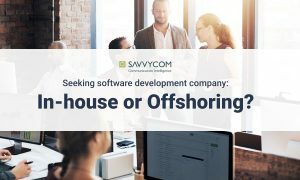 Savvycom believes in meeting and exceeding customer expectations by making use of standard, best practices for RoR solution development. To discuss how we can help you, please contact us now! What Makes a Successful Mobile App Development Company?